A pretty playable instrument, certainly, and arguably more characterful than its Grand sibling. Decent sounds. Good selection of MIDI files and auto-editing capabilities. 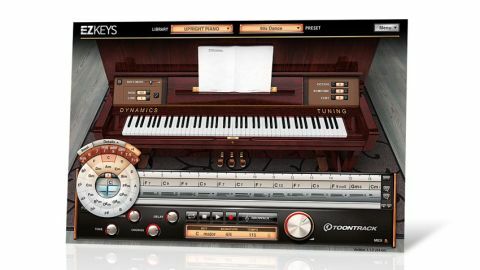 Designed for songwriters, EZKeys Grand Piano (which scored three and a half stars when reviewed back in April) is a sample-based grand with a difference. "We'd probably go for the EZKeysUpright over the Grand if we were buying afresh"
Not only does it give you said instrument, but it also comes with a good selection of MIDI files that can be 'auto-edited' in all manner of ways (with even more in the surprisingly generous v1.1 update). Now we have EZkeys Upright Piano. The price above is for the full version, which gives you all the features of the grand piano iteration but with an upright piano (sampled from an Östlind & Almquist) providing the sonics instead. However, existing EZKeys users can pay half that (£55) to get the upright as an add-on. The presets are usable, too, particularly those aimed at dance music. In fact, we'd probably go for the Upright if we were buying afresh. You'd have to be pretty in love with the EZkeys concept to shell out over £150 to get both instruments, though.